This month’s selection of ‘to die for’ products is so irresistible, I absolutely can’t live with them nearby. One of my readers will save me by entering this giveaway and winning them all. 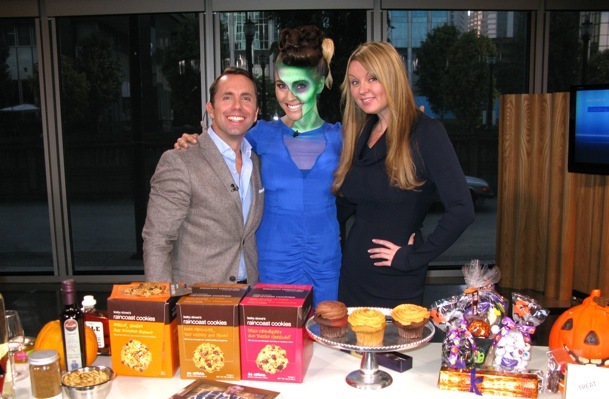 My airbrushed Hallowe’en costume, hair ‘do, and electric blue dress made this segment so much fun. Huge thanks to ‘Glitter Machine’ make-up artist Jennifer Little, Avant Garde hair stylist Isolde Sample, and my favorite Chinatown boutique, Charlie & Lee, for making this look possible. 1. 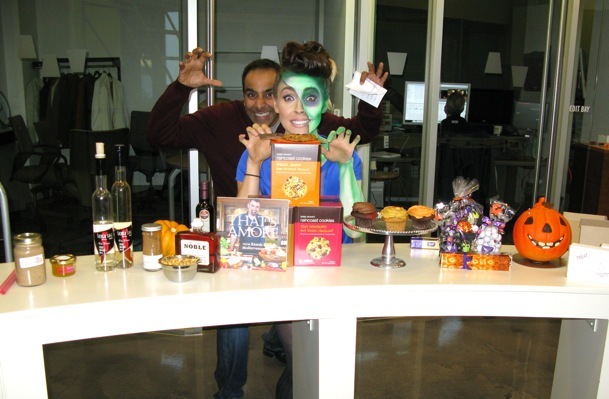 Beta 5‘s Trick & Treat Chocolate Boxes — including incredible wasabi & miso caramel chocolate sticks. 2. Thomas Haas Hallowe’en Chocolates — for the luckiest trick or treaters out there! 3. Purdy’s Chocolates‘ Hallowe’en Chocolates & the new ‘Turona’ Truffle — the classic chocolates we all grew up with. 4. Original Cupcakes by Heather & Lori — try the ‘Great Pumpkin’ with pumpkin spice cake & pumpkin buttercream. 5. Lesley Stowe’s Raincoast Cookies — of the three flavors, ‘Apricot, Ginger, & Slivered Almond’ is my favorite. 6. Dirty Apron’s Orange Spice — for savory roasted pumpkin seeds. 7. Noble Maple Syrup from The Dirty Apron — for sweet roasted pumpkin seeds. 8. ‘That’s Amore‘ Cookbook by Ricardo Scebba of Ricardo’s Mediterranean Kitchen — Halibut Cheeks & Panna Cotta are my favorite recipes. 9. The Flame dessert wine by Silver Sage Winery — so hot, it’s scary! …sip slowly and enjoy the tingling aftertaste. 10. Mango Pearls from Qualifirst Foods — use these as ‘mini eyeballs’ for your Hallowe’en cocktails. 11. The Juice Truck’s ‘It’s To Die For Banana Bread Smoothie’ launching this November. Look who snuck up on me! Tech expert, Akash Sablok. I think he was eyeing the chocolates.